Olena here and Today I am sharing a card I created with beautiful Bella Spring CottageCutz Collections. For my Tulip card I used Bella Spring Tulips die. First, I made embossing frame, using Embossing Folder and white cardstock. Then, I cut out oval shape using red and cream cardstock. Next, I cut Bella Tulips out, sponged and glued to red oval and cream. All ovals I added to Embossing Frame using foam tape. I, also, added ribbon on Tulips image and embellishments to card front as shown in picture above. Olena, another beauty made by you. So gentle and nice. Beautiful card. Olena your card is absolutely stunning hun!! 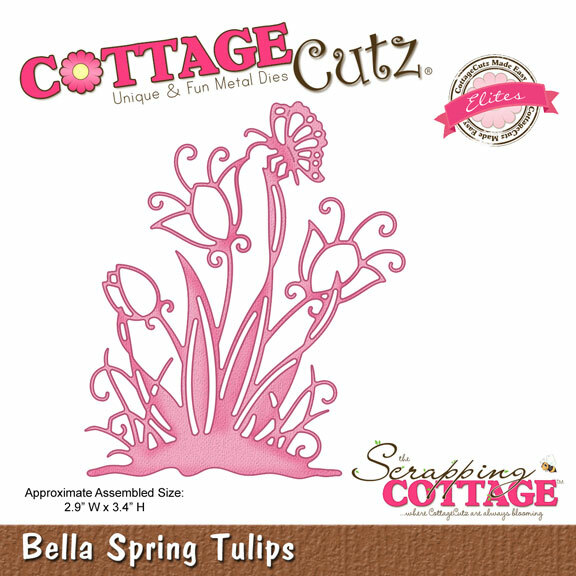 Love how you did the Bella spring tulips, they are beautiful!! Love the embossing too!! Absolutely gorgeous!!!! Love how pretty that die looks on the card!